Senior outside hitter Sofia Lavin gets blocked at the net. 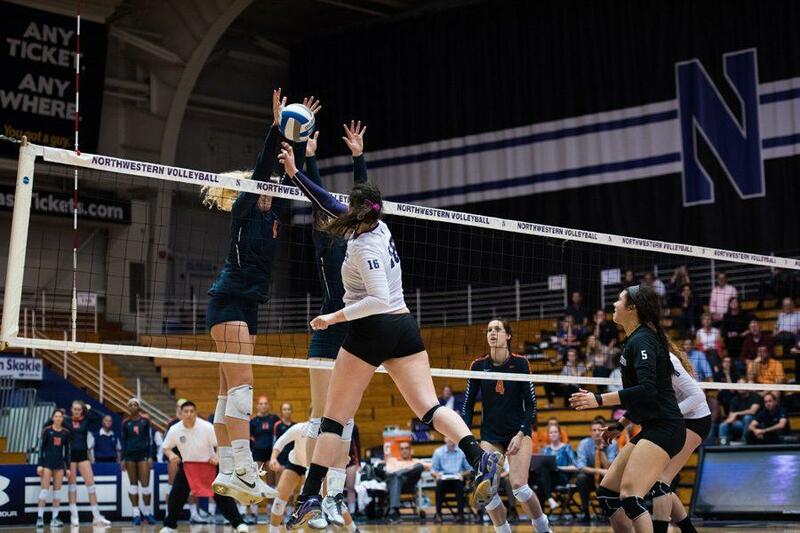 Northwestern hit well in its game against Indiana but struggled with serving in the four-set defeat. It was a rocky start to the Big Ten season for Northwestern on Wednesday night. The Wildcats (7-6, 0-1 Big Ten) struggled mightily in their first conference match of the season as they fell on the road to Indiana (12-2, 1-0) in four sets. NU, unable to handle Indiana’s aggressive attack for the majority of the match, missed 14 serves while also totaling 11 receiving errors. After dropping the first two sets, the Cats clawed back to take the third set 27-25, fighting off a match point in the process. The improved overall play in the third set was the high point of the match for NU. While the team’s defensive and passing games were not up to par, the offensive side of the net was much more indicative of the Cats’ play throughout the season. NU tallied 44 kills in the match. Junior outside hitter Symone Abbott once again led the team’s attack with 15 kills of her own. “Our offense was really good tonight,” Abbott said, but added that the team’s “lacking” serve and pass game hindered the offense from being even stronger. While this was not how the team envisioned the outcome of its first Big Ten match, a quick turnaround forces it to move on and continue to prepare for the challenging conference schedule. NU will return to Evanston on Sunday for its first home contest of the season. The Cats will take on a perennial volleyball power in No. 18 Penn State (9-3, 1-0 Big Ten) while going for their first conference win. The seven-time national champion provides a difficult task for NU. However, the team is eager for a chance to take down the Nittany Lions at Welsh-Ryan Arena for the second consecutive season. The Nittany Lions have 11 players that measure six feet or taller, and the team ranks second in the Big Ten in hitting percentage. Junior setter Taylor Tashima knows the significance of such a game for the Cats and what the team needs to do in order to grab a win against the storied Penn State program. Davis, knowing the potential meaning in a win over Penn State, is adamant that NU must execute its game plan in order to conquer volleyball’s Goliath. The home opener holds valuable opportunities for the Cats. The players know this, and Tashima sees the team is ready for the moment.